Melissa Hill, and Greg Bridges, RN, are changing the way health care is delivered through Home Care Assistance. For the better part of a decade Melissa Hill and Greg Bridges traveled Oklahoma trying to improve the health care landscape in our state. They saw the good and often times the bad. What they walked away with was a better understanding of what assistance seniors need to stay in and thrive in their own homes as long as possible. And through that, Home Care Assistance was born in the metro. 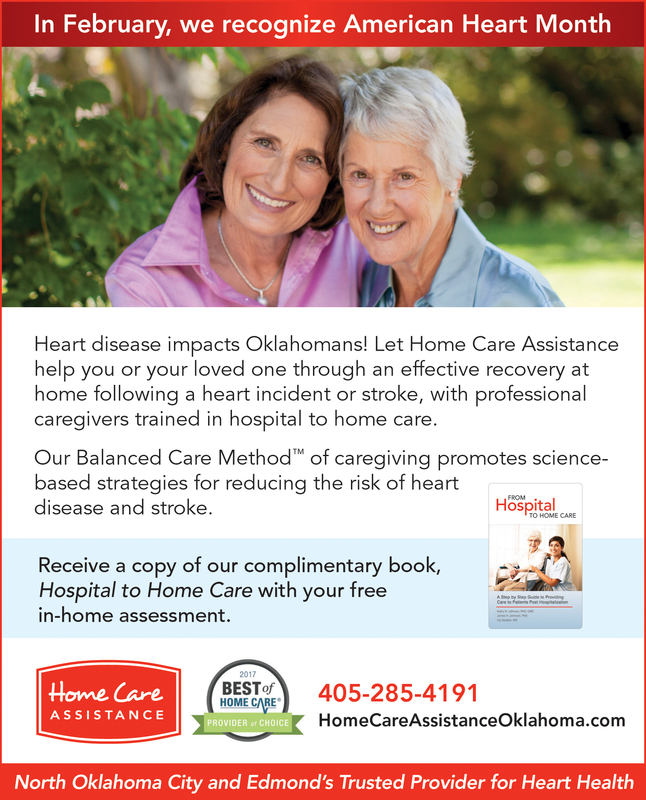 The group has cared for Oklahomans through Home Care Assistance for almost four years now. Bridges – who brings more than 35 years of registered nursing experience to the company – worked with Hill consulting Medicare providers prior to opening Home Care Assistance. The answer to both questions could be found at home. Typically, Home Care Assistance hires just one in 25 applicants – all home health aides and certified nursing assistants. The focus is on activities of daily living – allowing clients to do as much as they possibly can on their own while also being there to help shore up any deficits. “It’s A through Z, personal care, dressing …” Bridges said. “Statistically, 60 percent of people who come out of the hospital with strokes have depression. Having that relationship with a caregiver one-on-one and not feeling like they are a burden … can really lift someone out of that depression. Services range from personal care to medications reminders, running errands and light housekeeping. “You want to maintain an optimal environment for them to thrive,” Bridges said. Bridges noted that as health care moves more towards an in-home setting it’s important to understand that bringing someone into your home has legal ramifications. The Oklahoma State Department of Health is cracking down on “rogue” caregivers who are unaffiliated with licensed agencies. The reason is that these individuals often do not go through state and national background checks, carry workman’s compensation insurance or withhold required taxes. Home Care Assistance leans heavily on Bridges’ three decades of experience ranging from the ICU into the home. “With us you transfer that into the home and the practical things that keep a person safe,” Bridges said. “We try to focus on consistent assignments so the same caregiver and same team knows the patient’s idiosyncrasies. And we’re the owners and I’m the case manager so we know each client intimately and because of that we can intervene and tailor a plan of care. Most clients who utilize Home Care Assistance are in their 70s or 80s – although Hill points out one client just turned 101 – and need assistance dealing with multiple chronic conditions. Heart and pulmonary issues are prevalent as are Alzheimer’s and dementia. Following an acute medical issue is often when families realize not only the value but the need for assistance in the home. Through its Hospital Readmission Reduction Program, Medicare has been financially penalizing hospitals with high rates of Medicare readmissions and is extending the penalties to other settings of care such as skilled nursing facilities. It’s estimated that in 2017 hospitals with relatively high readmission rates were penalized more than half a billion dollars. That occured when Medicare patients were readmitted to the hospital within 30 days of discharge for the same diagnosis. February is Heart Health Month, highlighting the leading cause of death for men and women. Hill points out that the good news is heart disease is also one of the most preventable diseases. And heart disease can be managed at home. “We see a lot of people coming out of the hospital after a heart incident or a stroke and that’s the perfect time to have in-home care services to help people recover,” Hill said. “That first 30 to 90 days after a hospital stay people are in a pretty vulnerable state. In late January, Home Care Assistance was honored by Home Care Pulse as a 2018 Best of Home Care aware winner in both provider and employer categories. You can find out more at www.hospitaltohomecare.com.